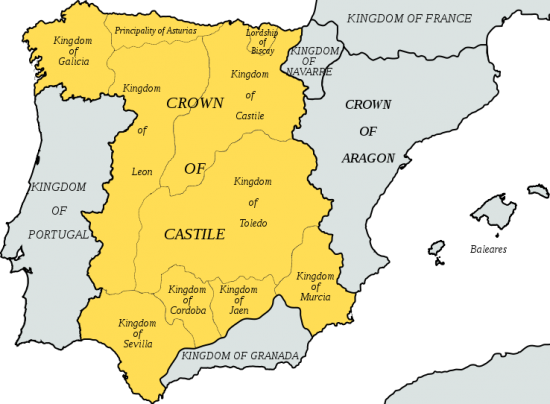 The Kingdom of Castile was established in 1065 under King Sancho II of León and Castile. Ferdinand I of León had been Count of Castile and he became King of León by right of his wife, Sancha of León. He became King of León and Castile in 1037 and upon his death in 1065, Castile and León were divided among his sons. Sancho became King of Castile while Alfonso became King of León. 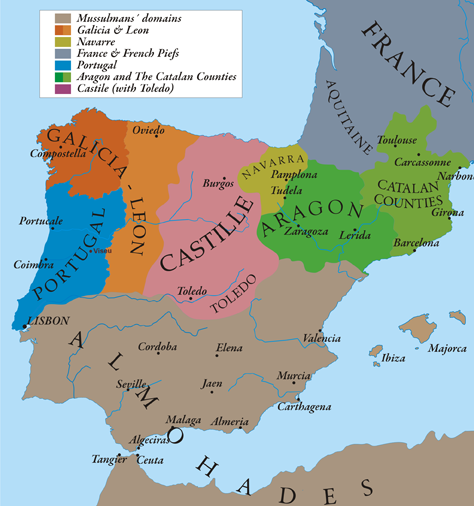 Sancho was briefly also King of Léon after deposing his brother and is thus known as “of León and Castile” but by 1065 the two Kingdoms were not in a union anymore. Sancho was married to an “Alberta” but not much is known about her and they had no children. He was succeeded by his brother Alfonso VI, the same one he had deposed. Alfonso’s first wife was Agnes of Aquitaine and she is thus the first Queen of Castile of who we know more than just a first name. She was the daughter of William VIII, Duke of Aquitaine and was probably dead by 1077. In 1079, Alfonso married Constance of Burgundy with whom he had several children, though only a daughter named Urraca survived to adulthood. Constance died in 1093. That same year, he married a woman named Berta but she died in 1099. He then married a woman named Isabel with whom he had two daughters. She probably died in 1107. He then married a woman named Beatrice. They had no children and she survived him. Alfonso was succeeded by his daughter Urraca. Urraca had married Raymond of Burgundy at the age of eight. They had a surviving daughter and son. She was widowed in 1107, and new marriage negotiations were underway when her father died. A marriage to Alfonso I of Aragon and Navarre was proposed, but Urraca protested against this. It was her late father’s wish, so she eventually agreed. They married in 1109, but the marriage immediately sparked rebellions. They separated in 1110. She took a lover with whom she had two illegitimate children. She died on 8 March 1126 and was succeeded by her son, now King Alfonso VII. Alfonso married Berenguela of Barcelona in 1128 with whom he had seven children. She died in 1149 and he remarried to Richeza of Poland with whom he had a further two children. Alfonso restored the tradition of dividing his Kingdom among his children. Sancho became Sancho III of Castile while Ferdinand became Ferdinand II of León. Sancho married Blanche of Navarre in 1151 and they had one surviving son. He succeeded his father in 1157 but died just over a year later. His two-year-old son became Alfonso VIII of Castile. The regency caused chaos and some lands on the border were conquered by his uncle. He needed a strong ally and he got one in the former of King Henry II of England when he married his daughter Eleanor of England. They went on to have 11 children, though not all lived to adulthood. When Alfonso died in 1214 he was succeeded by his youngest child and only surviving son Henry. He never married and died at the age of 13. Henry was succeeded by his eldest sister, Berengaria. Berengaria had married Conrad II, Duke of Swabia in 1187 but the marriage was not consummated and Conrad died in 1196. In 1197, she married her first cousin once removed Alfonso IX of León to secure peace between the two kingdoms. The Pope objected to the union of the grounds of consanguinity. While fighting the pope, they had four surviving children. They eventually lost the fight over their marriage but their children were considered to be legitimate. When her brother died, Berengaria feared that her own former husband would try to claim the throne. She realised that Castile would need a true military leader and abdicated in favour of her own son that same year. Her son became King Ferdinand III of Castile. She remained by his side as a royal advisor. When her former husband died in 1230, he attempted to give the Kingdom of León to his daughters from his first marriage. Berengaria was instrumental is negotiating and eventually, the two daughters agreed to a sum of money in order to renounce the throne. Ferdinand was now also King of León. In 1219, Ferdinand had married Elisabeth of Swabia, and they had ten children before her death at the age of 30. 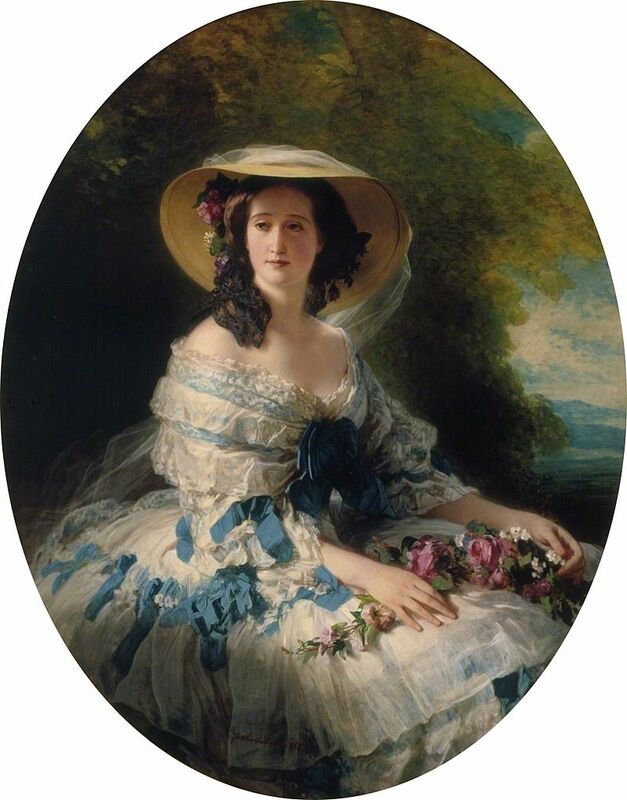 He remarried to Joan, Countess of Ponthieu and had a further five children. The courts now merged, which is considered to be the foundation of the Crown of Castile. When Ferdinand died in 1252, he was succeeded by his eldest son, now King Alfonso X. Alfonso had married Violant of Aragon 1249, and they had 11 children. When Alfonso died 1284, his eldest son Ferdinand de la Cerda had predeceased him leaving behind two young sons. The rights of these boys were usurped by Alfonso’s second son, now King Sancho IV of Castile. He had married María de Molina in 1282, and they had five surviving children. Sancho died in 1295, and he was succeeded by his nine-year-old son Ferdinand, now King Ferdinand IV under the regency of his mother. Ferdinand married Constance of Portugal in 1302, and they had two surviving children. Ferdinand died in 1312 at the age of just 26. He was succeeded by his one-year-old son, now King Alfonso XI. Constance died in 1313 and the regency was led by his grandmother. Alfonso first married Constanza Manuel in 1325 but that marriage was annulled. In 1328, he married Maria of Portugal and they had one surviving son. He also had ten children by his mistress Eleanor of Guzman. Upon his death in 1350, he was succeeded by his only legitimate son, now King Peter of Castile. Peter married Blanche of Bourbon in 1353 while also keeping on his mistress María de Padilla. He had two surviving daughters with María and he abandoned Blanche three days after the wedding. María and Blanche both died in 1361. Blanche was murdered. Peter was deposed in 1366 during the Castilian Civil War by his illegitimate half-brother, Henry. He was briefly restored but Henry killed him in 1369 and became the first ruler of the House of Trastámara as King Henry II of Castile. On 27 July 1350, Henry had married Juana Manuel and they had two surviving children. He also had several illegitimate children. Upon his death in 1379, he was succeeded by his son, now King John I of Castile. On 18 June 1375, he had married Eleanor of Aragon and they had two surviving sons. Eleanor died in childbirth in 1282. John invaded Portugal in 1383 to press his claim as King by right of his new wife, Beatrice of Portugal, but he was defeated in 1385. They had no children and upon John’s death in 1390, he was succeeded by his eldest son, now King Henry III of Castile. His second son Ferdinand was elected King of Aragon in 1412. Henry III settled a long-running dispute by marrying Catherine of Lancaster in 1388. She was the daughter of Constance of Castile, the eldest daughter of King Peter of Castile and María de Padilla. They had three children. Henry died on 25 December 1406, still only 27 years old and was succeeded by his only son, now King John II at the age of just one. In 1418, John married his first cousin Maria of Aragon. They had four children, though only one son, the future King Henry IV survived to adulthood. Maria died in 1445 and John remarried to Isabella of Portugal and had a further two children by her. John’s reign was a long one, and when he died in 1454, he was succeeded by his eldest son, now King Henry IV. Henry IV had married Blanche of Navarre in 1440 but that marriage remained unconsummated and was annulled in 1453. He remarried to Joan of Portugal in 1455. In 1462, Joan gave birth to a daughter, Joanna la Beltraneja but not all were convinced that Joanna was Henry’s daughter. His half-siblings were Alfonso and Isabella and the controversy surrounding Joanna led to a civil war that eventually saw Alfonso declared heir to the throne. Alfonso died in 1468 and Isabella took his place and was recognized as heir. When Henry died in 1474, Joanna was backed by Portugal (she married her uncle Afonso V in 1475) and Isabella was backed by Aragon. Isabella won the throne and became Queen Isabella I of Castile. She had married the future Ferdinand II of Aragon in 1469. They went on to have five surviving children. Their marriage began a familial union of the Crowns of Castile and Aragon. In 1492, they conquered the last Moorish state of Granada and ended Muslim rule in Iberia. Upon Isabella’s death in 1504, she was succeeded by her second daughter Joanna. Isabella’s only son had died at the age of 19, and her eldest daughter had died in childbirth at the age of 27. She was Queen in name only and her husband Philip held the authority as King Philip I of Castile. When Philip died in 1506, her father acted as regent. Joanna and Philip had six children, and when Ferdinand died in 1516, their son Charles was proclaimed King of Castile and of Aragon in joint authority with his mother. He also inherited the Habsburg Netherlands from his father, and he was elected Holy Roman Emperor in 1519. Charles married his first cousin Isabella of Portugal on 11 March 1526 and they had three surviving children before Isabella died in childbirth in 1539. Charles abdicated as ruler of the Spanish lands in January 1556 in favour of his only son, King Philip II. In September 1556, he abdicated as Holy Roman Emperor in favour of his brother Ferdinand. Philip II was married four times. 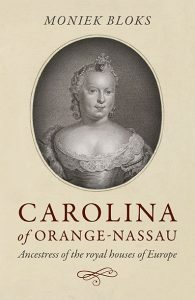 He married first his first cousin, Maria Manuela, Princess of Portugal. She died four days after giving birth to a son, Carlos. 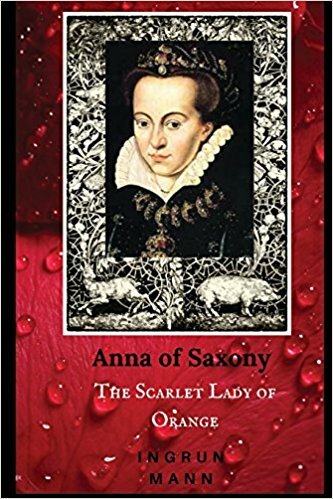 He then married Queen Mary I of England but they had no children and she died in 1558. In 1559, he married Elisabeth of Valois and they had two surviving daughters. She died in 1568 shortly after a miscarriage. In 1570, he married his niece Anna of Austria and they had one surviving son, the future Philip III of Spain. Philip II died in 1598 and was succeeded by his only surviving son, Philip III. Philip married his first cousin, once removed, Margaret of Austria. They had eight children, though only four lived to adulthood. She died at the age of 26, shortly after giving birth to a son. Philip III died in 1621 and was succeeded by his son, Philip IV. In 1615 he had married Elisabeth of France, and they had seven children, though only one daughter survived to adulthood. Elisabeth died in 1644 and in 1649, Philip remarried to his niece, Mariana of Austria. They had five children, though only two lived to adulthood. His only son, Charles II, succeeded him upon his death in 1661. Charles was mentally and physically disabled due to the many generations of inbreeding. He was married twice, first to Marie Louise of Orléans who died in 1689 and secondly to Maria Anna of Neuburg. He had no children by either of wives. Upon Charles’s death in 1700, the War of the Spanish Succession broke out. 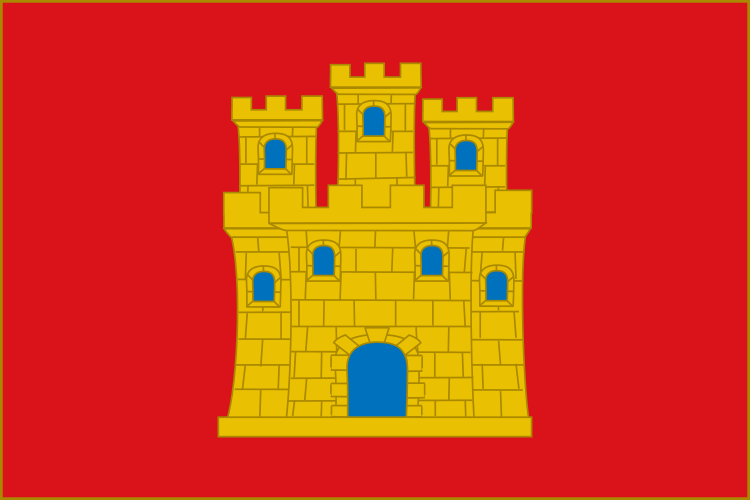 When the war was finally over, all the territories were unified as a single country under the Crown of Spain and Philip V of Spain, a great-grandson of Philip IV through his daughter from his first marriage.